Recognise the picture on this book jacket? It’s the same pic that headed my last post. Not that you can make much out with the type obscuring most of the image (the designer also chose to flip the photo). It’s the right choice for the book though, which is a collection of Evelyn Waugh’s travel writing from the 1930s. 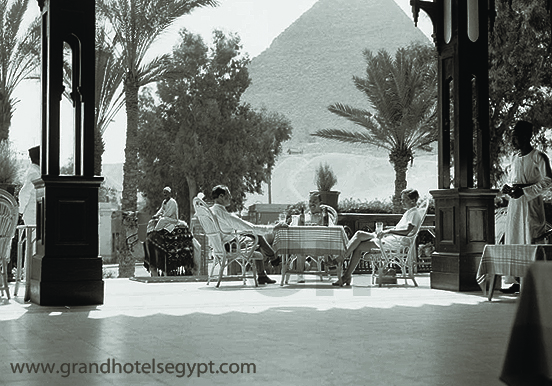 The photo was taken in 1938, and the exotic hedonism on display (what a wheeze, a picnic on top of a pyramid! And in bathing togs!) is a good fit for the reputation Waugh had at this time, which was as the satirical chronicler of England’s party-happy, silver-spoon set, otherwise known as the Bright Young Things. Funny thing is that the author himself had a mostly miserable time when he visited Egypt. 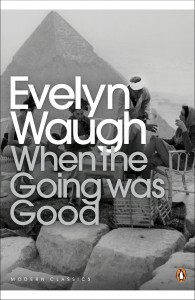 It was 1929 and on the back of rave reviews received for his first novel, Decline and Fall, Waugh had been commissioned to write travel articles in return for a free Mediterranean cruise, which he and his new wife (bizarrely, also called Evelyn) were treating as a delayed honeymoon. But She-Evelyn contracted double pneumonia and had to be put ashore and hospitalised in Port Said. She was so critically ill Waugh didn’t expect her to survive. When he wasn’t at his wife’s bedside Waugh was exploring the town, spending more time there than probably any other travel writer before or since. He escaped to Cairo for a brief overnight stay, putting up at the Bristol Hotel. He was not impressed – the furniture in his room, he wrote, consisted of three double beds under high canopies of dusty mosquito netting and two derelict rocking chairs. None of the servants spoke a word of any European language but Waugh considered this a negligible defect since they never answered the bell anyway. Despite being terrifically snobbish and curmudgeonly beyond his years (he was only 26 at the time), he is funny: his observations on the porters for example, whose aim, he establishes, is to carry away the smallest piece of luggage possible, so the strongest and most fierce gets away with carrying a bundle of newspapers or a small attaché case, while the puniest end up with the trunks and large cases. The Waughs’ trip to Egypt forms part of a book called Labels (later collected with three other travelogues and reissued as When the Going Was Good), except the odd thing is She-Evelyn doesn’t appear. Just a month after they returned home to England, without warning, she revealed that a mutual friend had become her lover. The couple promptly divorced and a devastated He-Evelyn wrote his wife out of his account of their honeymoon, presenting it as a bachelor’s journey. Just over a decade later he was back boozing on the terrace of the original when in 1941 he returned to Cairo as one of a 2,000-strong commando division known as Layforce. He took part in the evacuation of Crete, an episode that would later find its way into his Sword of Honour trilogy, published in the 1950s. Layforce was disbanded only a few months after arriving in the Middle East but one of its senior officers, David Stirling, almost immediately created a new desert commando unit in Egypt that would go by the name of the Special Air Service, or SAS. 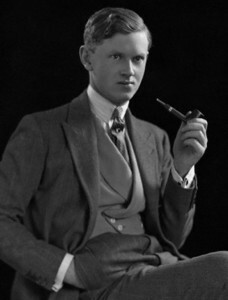 But that’s another story – and one Waugh had no part in as by this time he was back in England at work on his sixth novel.